It is pointed out by many companies that hiring consultant did not change the company at all just giving the information with the thick, meaningless report or just introduce new system like CRM or personnel system. Such failure of the consulting occurs since these consultants do not consider the motivation management, just dealing with the corporate structure, not clarify where they have to focus in the project, or not suggest the effective parallel practice of the several measures. 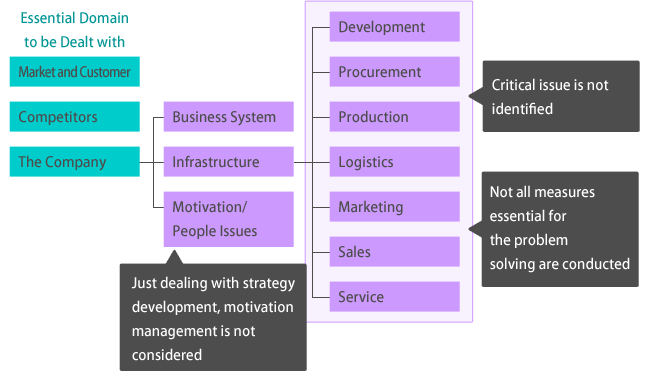 For the successful outcome of the project, following three important elements in consulting should be seriously considered; “what is the critical issue of the company”, “what kind of measure is effective to solve the problem”, and “how can the company actually conducts the measure”. Our consulting aims to change the company for the improvement of the performance by finding the critical issue and developing suitable measures.